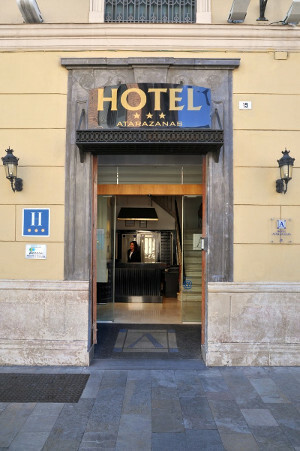 Atarazanas Málaga Boutique Hotel is a 3 Stars Hotel located right in the Old Town City Center opposite the Indoor Market Atarazanas, and just few meters away from Malaga’s main Street Marqués de Larios. Our hotel has 68 rooms with two completly different decoration styles after our expansion and renovation. Some rooms are contemporary and comfortable and others modern and functional, both were designed to satisfy all our guests. We also have a Cafeteria with Breakfast service (Gluten and Lactose Free under request) there is also a cybercorner free for all our guests, a 24 hours Self-service Corner Bar and a “ Forgebrary” where to enjoy a variety of books. Accessible hotel with rooms adapted for people with reduced mobility. Easy access by car, with an area for (un)loading available at the entrance. The hotel is perfectly connected, a few minutes away from the harbor, where large cruises arrive to its docks daily. We are just 5 miles away from Pablo Ruiz Picasso International Airport and 3 miles from the Trade, Congress and Exhibition Center of Malaga. Our staff will always be at your service, and will inform you about the available options you have to enjoy your free time, either gastronomic, cultural or entertainment information, all with friendly, warm and personalized treatment.